On June 13, 2018, the International Foundation for Electoral Systems (IFES) will co-host a side event panel discussion at the Conference of States Parties for the UN Convention on the Rights of Persons with Disabilities (CRPD) with Disabled People's International (DPI), Special Talent and Exchange Program (STEP), National Assembly of Persons with Disabilities (NAPD), Fight for Right, United Nations Development Programme, Election Commission of Pakistan, United Kingdom Department for International Development (DFID), and United States Agency for International Development (USAID). Full text of the flyer is available below. ASL interpretation and captioning will be available. Marginalized populations, including women, persons with disabilities, young persons and people from ethnic or religious minorities experience systemic discrimination, and in some cases, physical or psychological violence that undermines their political rights. The intersection of different social identities compounds barriers to meaningful political participation. 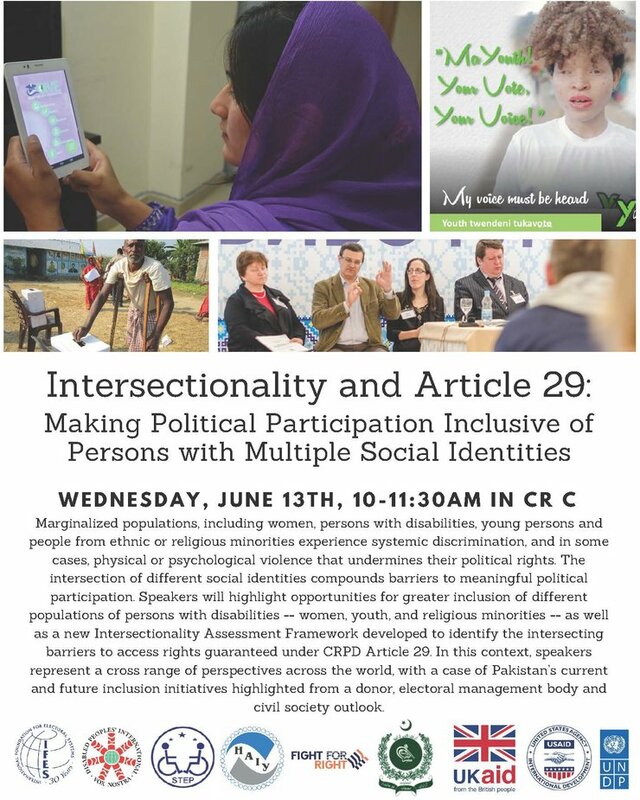 Speakers will highlight opportunities for greater inclusion of different populations of persons with disabilities --women, youth, and religious minorities --as well as a new Intersectionality Assessment Framework developed to identify the intersecting barriers to access rights guaranteed under CRPD Article 29. In this context, speakers represent a cross range of perspectives across the world, with a case of Pakistan’s current and future inclusion initiatives highlighted from a donor, electoral management body and civil society outlook.